Persona 5 is an explosive sequel, the kind that comes after years of growing success and awareness. It happens when all the eyes are finally pointed squarely at the brand. It’s a massive game, both in scale and ambition, which is something that only comes when the folks in charge of the money finally toss the team that extra couple of zeroes for the budget. The moment you turn it on, it assaults your senses with impossible colors and constant movement, all the way down to the hyperactive menu interfaces. 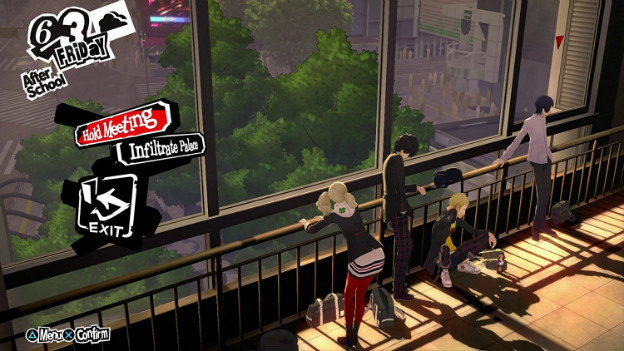 Persona 5 wants to show you a good time and show your attention span who’s boss. It also wants the longtime Persona fans to approach its consistent themes from a different angle. Does it succeed? Totally. Persona, especially its latter half, is all about youth and self. It’s about a ragtag Scooby gang of teenagers trying to save the world, but also make it through high school without being smothered under a pile of social stigma. Most games have generally felt like a celebration of youth, despite the murderous demons and plotting villains. Persona 4 especially, the game that really pushed the snowball down the mountain, was all about working through your problems, finding yourself, and building and cherishing the relationships you build along the way. 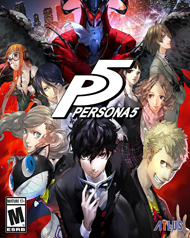 Persona 5 is the same, but there’s a thick layer of unpleasantness on top. Being a kid isn’t all bright colors and superpowers, especially in the very Japanese context of Persona. The generational gap between kids and adults being a social battlefield has been a running theme in Japanese pop culture, with tons of works about adults abusing their power. Battle Royale, anyone? Persona 5 explores, sometimes ham-fistedly, an additional running theme of captivity. Much of this manifests itself in miniature story arcs all about how horrible adults can be to children. It all starts with you, the prototypical “good at everything” Persona protagonist. Except, instead of a blank slate transfer student who comes out of nowhere and woos all the ladies, you have a big problem. You have a criminal record and the only thing keeping you out of juvenile detention is a probation stint in an unfamiliar town, living with a grumpy old man who’s only motivation in keeping a roof over your head is a paycheck. You start school and immediately realize everyone thinks you’re a drug-addled murderer. Good luck finding any friends when everyone thinks you’re scum. Eventually, the supernatural tomfoolery kicks in and the Scooby gang gets together. Once that happens, the incredibly goofy motif kicks in. Likely an attempt to add some levity to a surprisingly downbeat tone, everyone’s powers are based on being Lupin III-style thieves. Once the Persona thing happens, everyone gets a cool mask, a dope costume and a sick codename. It’s a bittersweet reminder these are high school kids, much more capable and willing to find a silver lining in a horrible situation. With the zany motif comes almost a complete overhaul in the Persona style of dungeon crawling. Before, the series had a sort of Mystery Dungeon feel, with procedurally-generated dungeons and a bunch of monster-smashing. It was fine, especially in Persona 3, although the lack of justification in Persona 4 made it feel more bland than it should have. 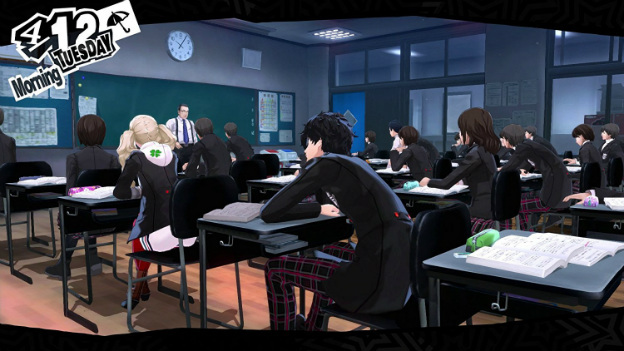 Persona 5 tosses that out the window with each dungeon, save for some cool side content, having deliberate designs. That’s because the whole game structure is built around navigating strange, alternate-reality structures, along with an intriguing, new stealth system. Being a band of righteous cat burglars, the idea is to get in, find the treasure, and get out without raising the alarm. In fact, raising the alarm too much gets the party booted out of the dungeon, losing precious time. If you run out of time, it’s game over. A meter goes up every time an enemy spots you (along with a severe disadvantage in the ensuing battle), and a full meter means the day is over. Sneaking up on an enemy depletes the meter, along with giving you a pre-emptive attack bonus. Beyond that, combat proceeds the way you would expect in a Persona game. If you aren’t familiar, consider Persona 5 a sort of M-rated Pokemon. The dungeons are littered with Shadows, creatures based on myths, religion, and sometimes pop culture. Skills are largely elemental, so collecting a variety of skills for pinpointing weaknesses pays off. If you land a super-effective attack, you get a bonus turn. The same rule applies to the enemy, hence the series’ reputation for difficulty. Your hero can use multiple Personas, gained from Shadows, while your party members each have a static Persona assigned to them.